Time to debunk a few myths for those of us raising choosy chowhounds. It’s not your fault. Except when it is. I’ll explain below. Also, it’s not a problem. Unless, of course, you decide it is. More on that later too. I don’t mean to be cryptic or glib about something that many parents — including moi — have grappled with over the years. If you’re concerned that your kid’s food fussiness is affecting his growth and development, then of course consult his pediatrician. And believe me, I do understand just how challenging it is to feed a child who has, ah, definite ideas about what he’s going to eat. And, yes, those stories about smug celebrity chefs whose offspring eat oysters and offal make me want to tear my hair out too. It’s just my boy is 11 now, I can see the light at the end of the “plain tofu please, Mummy” tunnel, and he’s a healthy, strapping lad who loves wholesome food, even though he is still particular about what and how he eats. (Strictly veg. Mostly raw. Preferably not touching. About five regular protein sources.) So be it. But don’t just take my word for it. What follows, sound advice about raising a fussy eater — all gleaned from foodie fathers. I don’t know what to make of that, if anything, other than to say: Thanks, Dads. Ethical epicurean Michael Pollan‘s teenage son Isaac is mostly over the selective slurping stage — which tends to peak in the toddler and preschool period — but he would only eat white food for many years, according to an intriguing recent interview with writer David Beers. We’re talking bread, pasta, rice, and potatoes. (Interestingly, Isaac would only wear black clothes back then as well, his dad reports.) That’s right: Ate white, and dressed black. Pollan, puzzled by his son’s behavior, finally figured out that in both cases his boy was trying to reduce sensory input. The kid clearly had some trouble processing stuff, including the sight, taste, feel, and smell of food, so he tried to make it as bland and inoffensive as possible. I could prattle on about my own experience with a son who has super sensitive sensory receptors but let me just add: This makes total sense to me. Trying to manage sensory stimulation when you’re an overly sensitive soul is simply a survival skill. Pollan’s son seems to have found a way to handle sensory input and enjoys cooking. He’s even a bit of of a food snob (those sensitive sensory organs at work, no doubt). My son’s the same: He’ll taste a sauce and is usually spot on in his assessment of whether it needs a drizzle of lemon juice, a splash of sesame oil, or a tad more garlic. Chances are then, if your wee one seems sensory sensitive, he may actually outgrow his food finickiness as he becomes more adept at managing sensory input. Pollan isn’t the only papa with a particular eater. 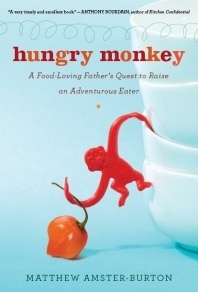 Seattle food writer Matthew Amster-Burton devotes an entire chapter to the phenomenon in his recent book Hungry Monkey: A Food-Loving Father’s Quest to Raise an Adventurous Eater. Early on his daughter Iris packed away pad Thai and spicy enchiladas, spinach and Brussels sprouts and Amster-Burton amusingly figured it was because of his impeccable culinary skills and no-compromise approach to child feeding. Well, every seasoned parent knows how that one turned out. Iris developed strong opinions about what she’d eat, her dad’s preference for spicy food, be damned. Amster-Burton didn’t freak out about his daughter’s about face. But he was curious to find out what it might mean for her health. Not much, it turns out. Here’s what he discovered in the course of working on his book: Researchers at the University of Tennessee reviewed the eating habits of 70 kids from ages two to seven, who were divided into two groups: picky and non-picky. 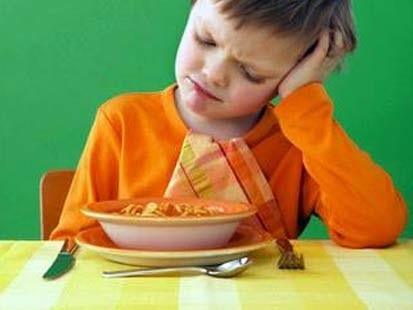 They found, as their parents indicated, that finicky eaters ate a smaller variety of food and were afraid to try new foods (called food neophobia in the scientific lingo) than the children who’d chow down on anything. No surprises so far. But here’s the kicker: A nutritional analysis revealed that the selective slurpers got just as many nutrients as the kids who gobbled everything put in front of them and there was no difference in height and weight between the two groups, according to the study findings reported in the Journal of the American College of Nutrition. So, then, picky eating may be frustrating but it’s not a medical problem, in the vast majority of cases. Amster-Burton checked with another source — his mom — and discovered that for, oh, about seven years all he’d eat was Cheerios, mac & cheese, pizza, white chicken meat if it didn’t touch anything else, and PB&Js. Amster-Burton isn’t the first parent to pass on his picky palate. Yes, folks, that’s right: Your child may well inherit his food fussiness and fear of new food from you. A 2007 study published in The American Journal of Clinical Nutrition found that a child’s aversion to unfamiliar foods has a compelling genetic component. Investigators analyzed the eating habits of 5, 390 pairs of twins between 8 and 11 years old and found that in 78 percent of cases the picky palates were inherited. Guilty as charged in this corner. My son’s selective ways are probably some cosmic payback for all those Sundays when I boiled an egg while the rest of my clan tucked into burgers. Amster-Burton acknowledges that having a finicky eater on board can be tiresome when you’re trying to put a meal on the table that everyone in the family wants to eat. Rather than “hide” unfavorite foods (a controversial practice that’s received a lot of attention of late), make two meals, or sign up for a nightly food fight, he looks for way to satisfy his taste buds and his kid’s. Hot sauce helps. I learned with my raw food aficionado to simply, duh, set aside some uncooked veggies I was chopping up anyway for a stir-fry or pasta dish. In addition, the adults of a picky eater need to become more adventurous themselves, Amster-Burton suggests, and in doing so may stumble on something new their child likes to eat. He discovered his daughter loves sukiyaki, a Japanese beef-noodle-and vegetable dish, so that’s now part of his family’s dinner-time repertoire. 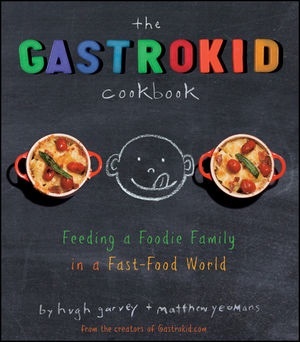 Hugh Garvey, an editor at Bon Appetit magazine, has a son Desmond, 5, who is primarily a brownivore and nearly a full-time greenophobe, says the co-author of the just published Gastrokid: Feeding a Foodie Family in a Fast-Food World. Garvey’s family serves as something of a petri dish: His daughter Violet, 8, eats it all, thus debunking the myth that “bad” parenting produces picky eaters. In fairness to Garvey’s little guy, he currently consumes anchovies, octopus, and bison; in many circles that would earn him adventurous eater cred right there. Not surprisingly, Garvey’s all for doing away with the picky eater label. And he’s pretty philosophical about the situation with his son. “We don’t cater to his druthers as much as we used to and we keep trying,” he writes. Seasoning can work wonders — Garvey’s book features several recipes with smoked Spanish paprika — and he recommends that an ingredient shouldn’t be placed on the no-go list (and then only temporarily) until it’s been offered in a variety of ways, whether steamed, pureed, roasted, sauteed, or julienned — or, might I suggest, completely raw and unadorned. Garvey offers this succinct assessment of eating with kids: “The only inevitable at the family table is surprise.” That strikes me as a pretty healthy attitude to this whole predicament. What say you? Thank you so much for laying out such a comprehensive analysis of little picky eaters. I don’t have any kids, but I’m fretting the day if and when I have one. My mother-in-law is quite critical of parents who have children resistant to eating certain foods. She’s not shy about suggesting to parents that their children need to ‘work with a therapist’ on sensory issues, which irked me because I felt it put undue pressure on parents when their kids seemed perfectly healthy to me. Kudos for such an informative article! This is a really good rundown on the subject. Clearly you did a lot of reading, and it shows in all the context in this post. When I was growing up, the only rule in our house was you have to at least *try* everything. I hated salad (but don’t anymore, fortunately), so I would take the tiniest TINIEST piece of lettuce I could find in the dinnertime salad bowl and put it on my plate. My parents had no choice but to laugh. Hey, technically I was following the rules, right? Thanks for the positive feedback, folks. This is a subject near and dear to my heart — or should I say mouth? I’ve periodically tried the “polite bite” policy but find it only really works in cooking classes with kids — not so well on the home front. All good info. However, some of us have discovered that “picky eating” is also a reaction to food. If it’s coming up in tandem with other issues like eczema, extreme mood swings, chronic congestion, etc., it may be the body’s attempt to get a handle on a reaction to something that the person is eating (it happens to adults, too!). My oldest gets rashes and, uh, “bathroom problems” in response to gluten and dairy; we also noticed that after an accidental exposure, he was much, MUCH pickier for about a week. He didn’t start eating solid foods until a month after we identified wheat as a culprit and removed it from my diet (he was exclusively nursing at the time, making “food face” anytime we tried to feed him something). A month after eliminating wheat, he grabbed a corn chip out of my hand and started chowing. Some of this phenomenon may be related to the sensory issues, actually. Sensory processing issues are one of those things that may mysteriously go away or get markedly better if you happen to eliminate the right food from one’s diet. It’s good to note that kids need the freedom to self-regulate. Now my six-year-old will often reject something on sight, and tell us he “doesn’t like it”; we remind him that he doesn’t *know* that unless he tries it, but there’s no requirements about eating. We all sit at the table, we all get some of whatever’s being served, and we don’t serve any alternatives until after the main meal is completed by at least one adult… but no one is required to eat anything they don’t want to. So it’s not like kids with identified and addressed food reactions (I don’t use the term “allergy” because not all reactions are mediated by the immune system, eg. celiac disease) will then eat EVERYTHING. But it is worth noting that *sometimes* “picky eating” is an indicator of something else going on. So glad you added this insight to the mix, Ironica. Makes total sense to me. I’m sure other parents of kids with food reactions would have similar stories. Thanks for chiming in with an important perspective on so-called picky eating that I didn’t explore in my post. Very interesting topic. For parents it’s a lot about knowing what you have control over and what you don’t, and acting sanely I think! I had “food rules” as a kid, too, MKES. Truth is, many “picky eaters” as kids are also choosy about what they eat as adults, but as a grown up your in the driver’s seat. Fortunately, my kids aren’t too picky when it comes to food, and will eat just about anything. When I was growing up, our family had this big table that my grandpa actually bought at the World’s Fair around the turn of the century (LAST century). It had a ledge underneath, and I’m guessing if I looked under there today — my mom still has the table — I’d find a few dried up Brussels sprouts near my place. I really can’t tell you enough how timely and encouraging this article is! As a foodie raising 2 mildly picky children and one off the chart picky child, this was just what I needed to read. As mentioned in the first comment, it drives me batty when people want to attach a bad parenting label to us when they discover just how picky our little one is. So…know that you encouraged this mama’s heart today! Welcome, Sara, and glad you found this post useful. And, I’ve learned from personal and professional experience, that it almost always gets easier as the kids grow up and get used to different tastes and textures. Hang in there!